Sometimes, a good hack is about using less rather than more. That’s the case with this neat tutorial from [Rahul.S] on driving a 7-segment LED display with an FT232. By using this cheap USB to serial controller, [Rahul.S] was able to drive the display directly without using a microcontroller, which keeps the component cost down. He’s bit banging an octal buffer connected to the display. You may be surprised to find that the FT232 chips do have enough outputs to make this work. Rather than send serial data number to the display and have a controller convert this into a set of signals that make the number, this conversion is done by the PC, which then sends a signal that directly illuminates the appropriate parts of the LED. By using all of the available output lines of the FT232 (including ones like the RTS/CTS line that are usually used for signalling), [Rahul.S] was able to drive all seven of the elements and the decimal point. The FTDI FT232 chip is found in thousands of electronic baubles, from Arduinos to test equipment, and more than a few bits of consumer electronics. It’s a simple chip, converting USB to a serial port, but very useful and probably one of the most cloned pieces of silicon on Earth. Thanks to a recent Windows update, all those fake FTDI chips are at risk of being bricked. This isn’t a case where fake FTDI chips won’t work if plugged into a machine running the newest FTDI driver; the latest driver bricks the fake chips, rendering them inoperable with any computer. 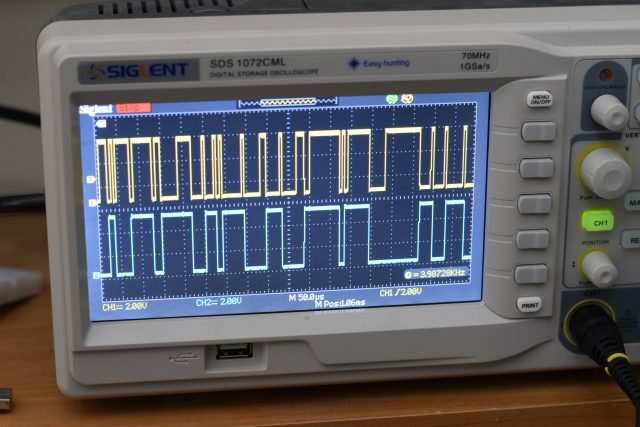 Reports of problems with FTDI chips surfaced early this month, with an explanation of the behavior showing up in an EEVblog forum thread. The new driver for these chips from FTDI, delivered through a recent Windows update, reprograms the USB PID to 0, something Windows, Linux, and OS X don’t like. This renders the chip inaccessible from any OS, effectively bricking any device that happens to have one of these fake FTDI serial chips. Because the FTDI USB to UART chip is so incredibly common, the market is flooded with clones and counterfeits. it’s very hard to tell the difference between the real and fake versions by looking at the package, but a look at the silicon reveals vast differences. 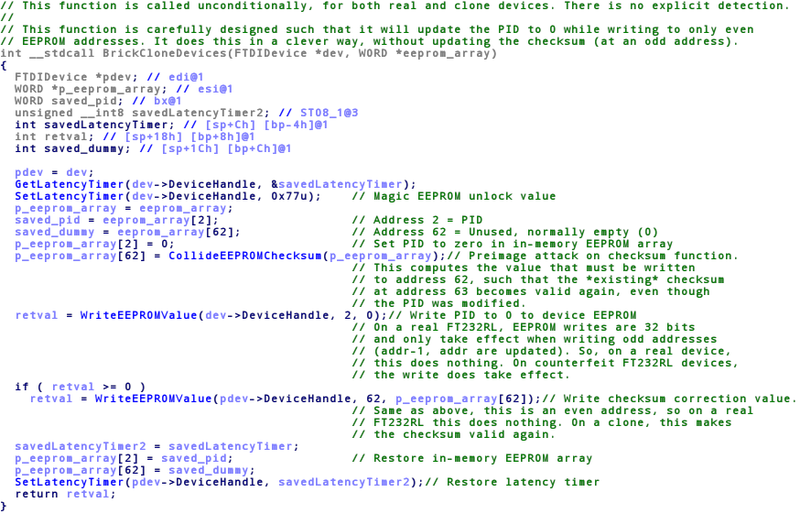 The new driver for the FT232 exploits these differences, reprogramming it so it won’t work with existing drivers. It’s a bold strategy to cut down on silicon counterfeiters on the part of FTDI. A reasonable company would go after the manufacturers of fake chips, not the consumers who are most likely unaware they have a fake chip. The workaround for this driver update is to download the FT232 config tool from the FTDI website on a WinXP or Linux box, change the PID of the fake chip, and never using the new driver on a modern Windows system. There will surely be an automated tool to fix these chips automatically, but until then, take a good look at what Windows Update is installing – it’s very hard to tell if your devices have a fake FTDI chip by just looking at them. 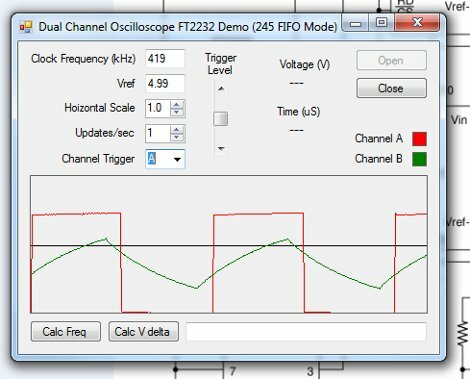 [RandomTask] has posted a nice tutorial on how to use a FTDI serial to usb converter, and a couple analog to digital converters to make a simple software oscilloscope. Using a “Universal Serial to USB converter” and one of many FTDI break out boards, he first reprograms the chip using FTDI’s programming software to put the device into a FIFO (first in first out) mode. From there a pair of ADC0820 8 bit digital to analog converters are wired up, and input is fed to a couple 555’s for testing. It should be noted that there is no input protection, so things like voltages above 5 volts, or negative voltages are a big no-no with this setup. It still could be very handy while working with micro controllers or other digital circuits. Data is then sent to the computer and displayed using a VB.net program, which has some basic features like scale and triggering, but also contains a couple bonuses like Calc Freq and Calc V delta calculation. Many people have these little serial to usb converters, and might be in need of a simple scope. If you’re one of them, then you can cobble this together pretty darn quickly, and cheaply. [Sprite_tm] automated a portion of serial hacking by sniffing out the baud rate using an ATtiny2313 and FT232 breakout board. The firmware assumes 8 data bits, no parity, and 1 stop bit (8N1). This is pretty much defacto among serial ports so it should work well, though some devices do use different settings. The auto detection routine can sniff rates as low as 110 baud and supports non standard rates. Released under GPLv3, the software is also supplied in hex format. [Sprite_tm] has provided great project in past such as Working with VFDs, Controllable bristlebot, and AVR boost converter. Additional information regarding serial hacking after the break.